I just want to start out this post by saying that all of this is purely speculation and there are no real plans to carry out any of what I’m talking about here. With that out of the way, I wanted to bring up a small detail posted in the NC4, or hybrid plan they are calling it, of the Southeast High Speed rail plan. If you are not caught up, this is the plan that was made up by citizens and leaders, another alternative that is being explored outside of the three alternatives that were on the table for the high speed trains coming into downtown Raleigh from the north. Jump over to Steven Waters’s Living Streets site for a great rundown of the proposed plan and benefits of the plan. Additional property tax revenue would also accrue to the city from new redevelopment opportunities from reclaimed land along the CSX tracks. The value of this land for redevelopment would be significantly enhanced with the reconnections of North and Lane Streets that would be made possible with this hybrid alternative. The benefit of having the CSX tracks removed would allow us to reconnect West Lane Street from Harrington up to West Street. My question I ask today is why can’t this be done now? First off, the obvious thing people will say is that some DOT requirement does not allow it. The tracks are probably too close to something and there is not enough room for whatever. It may not leave adequate space for some widget and it therefore conflicts with some thing-a-ma-jig. It’ll sound something like that, I’m sure. But if you walk it, I believe you may see it different. A road punching through the sandy lot would have no trouble until it just gets to West Street, where the railroad crossing comes through at a wide curve. If you take a look at the map, click it for a larger view, connecting the road seems to not have any trouble. When I was out there taking a look, the problem is most likely with Lane’s Street northern portion. 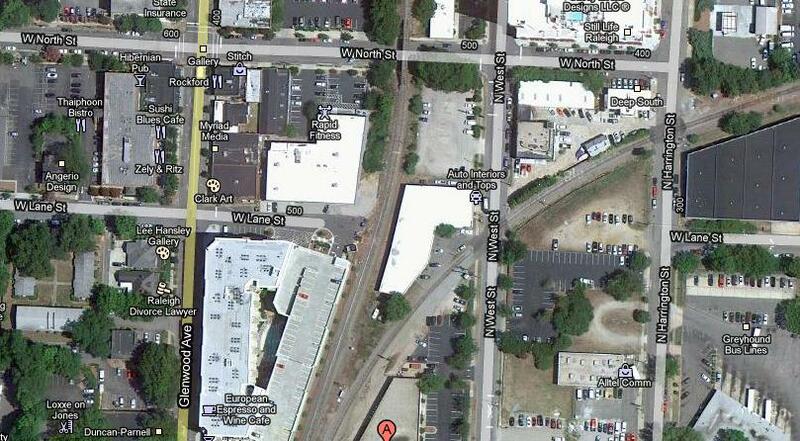 If it was actually laid across this block, any sidewalk would most likely hit the tracks a little before West Street. Here’s where it probably gets interesting. 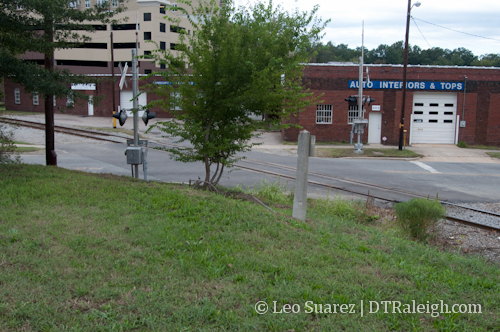 Since it looks like the sidewalks, and perhaps a small portion of the road, hit the tracks before West Street, a more elaborate crossing gate would be needed. If this is true then that adds more expense to the project. I can’t dive into the engineering costs of an idea like this cause I honestly am not in tune with this kind of work. Like I said before though, if you walk the area you can’t help but start to think why we cannot find a way to make it happen now. 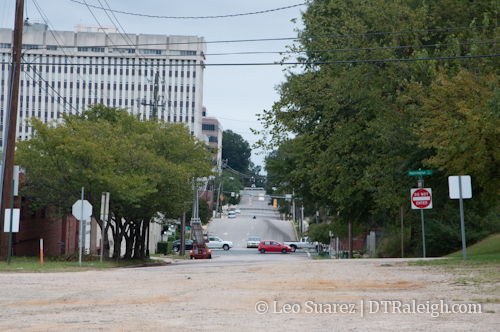 I’m a big supporter of having an intact street grid and this is one piece to the puzzle in downtown Raleigh. This connection can be a part of larger project to bring better connectivity to Glenwood South. If the road connection were put here, Lane Street could be converted to two way vehicular traffic. This would offer another entrance and exit to Glenwood South from the busy pair of roads of Dawson and McDowell Streets. You would also link Oakwood and Glenwood South’s neighborhoods much better, with a direct shot back and forth, even more so if a pedestrian connection goes through to Glenwood Ave. If the Blount Street Commons project ever finishes to its full plan, residents here would be much better connected also. Two way vehicle traffic also encourages walkability and is more bicycle friendly then the three lane Lane Street we have today. Car speeds will be slower and there can be parking along the side. Parking and foot traffic encourage businesses and hopefully the city can help foster that new growth that isn’t happening in this area already. Next time you are walking down Lane Street toward Glenwood South, do me a favor and walk over the lot to see it for yourself. It would be great to bring this to the table sometime. I’ve also thought about this Lane Street connection, and spoke to a view people about it. The most common refrain is that pedestrians don’t like to walk through tunnels. True if it’s narrow, dark and damp, so build one that’s not! Also, if the Auto Interiors and Tops business was relocated (part of the plan under the NC3 alternative), then the tunnel would cover a relatively short distance, coming back up to grade level before crossing the CSX tracks. A wild card here is also the light rail corridor, where the preferred option for Downtown is to run the lines down either West or Harrington Streets, requiring additional tracks in this same area. 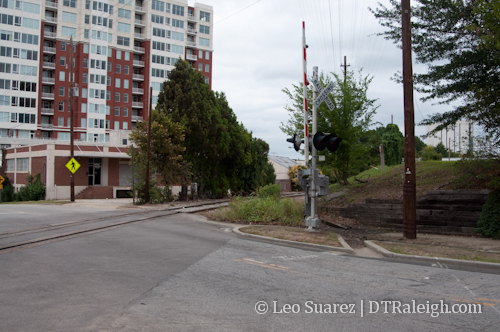 Two ideas/questions I haven’t seen – One, what is wrong with using the existing Amtrak route? and Two, have there been any below ground proposals? On-street parking and bicycle friendliness are opposing concepts. My comment submission to the process called for lowering Harrington and West below grade and create a lowered Lane to connect through. One of the engineering consultants at the open hearing in the convention center said that it had been considered but dropped due to costs. Engineering consultant and city of Raleigh – Enough! DO THIS RIGHT the first time and stop about the costs. Underground walk ways and streets have been around for decades. These solutions make it more expensive, but musch more efficient. Enough talk, let’s move forward with light rail, true lightrail. I think the “preferred” light rail option of West or Harrington street is only “preferred” from a cost perspective. It stays too far from the core of downtown Raleigh. The option (option “E” from the latest set of public meetings) that carries the trains along Wilmington, Salisbury, and Halifax from Memorial Auditorium up through the Seaboard area is the only one that provides adequate access to downtown. As for the Lane Street extension, if the “NC4 avoidance alternative” for SEHSR is selected, then Lane could easily be extended westward to West Street, and Johnson, Tucker, and North could all be extended east to Capital Boulevard. Both Lane and Jones would have to be closed to cars, though they could both be kept open for pedestrians. I think a pedestrian tunnel under the tracks is preferable to a bridge over them, for two reasons: 1) A bridge would have to be 25 feet above than the tracks, meaning you have to climb up and down 3 floors worth of stairs on either end, not to mention expensive elevators and/or massive and obtrusive ADA ramps. A tunnel on the other hand only has to descend about 10 feet so it would be easier to negotiate, and stairs/ramps would take up less space. 2) There are already numerous successful pedestrian tunnels in Raleigh (NCSU) so we should stick with what works.